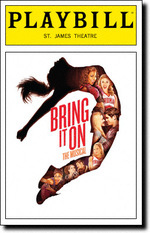 In Bring It On: The Musical, the high-stakes world of competitive cheerleading is intertwined with cutthroat high school politics to tell the story of Campbell, the heir apparent to the head cheerleader at Truman High School. Campbell is at the top of the cheerleader pyramid and she has it all — until a surprise letter arrives. Two squads, one mission: claim the title at the National Cheerleading Championships. The challenge: competition between the two teams is nothing compared to the competition inside them...and these girls can bring it.